Fish Species - 18 different species of fish, all with their own unique AI and behavioural patterns. 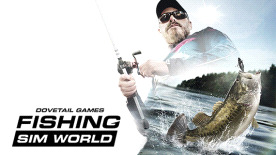 Tournaments and Multiplayer - Enter live tournaments and go from novice to a champion angler on our global leaderboads and challenge your friends and peers in multiplayer tournaments to hone your competitive edge. Beautiful Locations - Seven unique lakes, including a glacial Lake Boulder set in upstate New York, the sun-drenched Lake Johnson in Florida and with five European venues including the famous Gigantica Main Lake in France for its big carp and a challenging UK canal if monster Pike are your chosen prey. © 2018 Dovetail Games, a trading name of RailSimulator.com Limited ("DTG"). All rights reserved. "Dovetail Games" is a registered trademark of DTG. Unreal® Engine, copyright 1998-2018, Epic Games, Inc. All rights reserved. Unreal® is a registered trademark of Epic Games. Portions of this software utilise SpeedTree® technology (©2014 Interactive Data Visualization, Inc.). SpeedTree® is a registered trademark of Interactive Data Visualization, Inc. All rights reserved. All other copyrights or trademarks are the property of their respective owners. Unauthorised copying, adaptation, rental, re-sale, arcade use, charging for use, broadcast, cable transmission, public performance, distribution or extraction of the product or any trademark or copyright work that forms part of this product is prohibited. Developed and published by DTG.